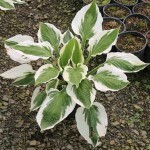 A compact, heat tolerant Hosta with dark green leaves with bright, wavy white edges. Blooms with lavender flower spikes in summer. It prefers full to part shade and moist soil.